It has long been recognized that the distribution of many extant avian taxa is very different from that of their Paleogene stem group representatives (Mourer-Chauvire 1982; Olson 1989). Mourer-Chauvire (1982) pointed out that the closest living relatives of several bird groups found in the Quercy fissure fillings in France are today restricted to the Southern Hemisphere. In particular, there is a notably high number of birds in these localities and other Paleogene fossil sites of the Northern Hemisphere whose closest extant relatives only occur in Central America or South America (Mourer-Chauvire 1999b; James 2005; Mayr 2005a). Such is true for stem group representatives of the Cariamidae (middle Eocene to late Oligocene of Europe and late Eocene to late Oligocene of North America), Steatornithidae (early Eocene of North America), Nyctibiidae (Eocene of Europe), Trochilidae (middle Eocene to early Oligocene of Europe), Todidae (late Eocene/early Oligocene of Europe and North America), and, possibly (see the comments in Sects. 14.3, 16.8), the Momotidae and Cathartidae. By contrast, the extant distribution of only two avian taxa with unambiguous Northern Hemisphere Paleogene stem group representatives is restricted to Africa south of the Sahara, i.e., the Coliidae (early Paleogene of North America and Paleogene and Neogene of Europe) and Sagittariidae (Oligocene and Neogene of Europe). Stem group representatives of the Madagascan Leptosomidae occurred in the early Eocene of Europe and North America. With the possible exception of the Anseranatidae (Sect. 6.4.2), no taxa have been reported from the Paleogene of the Northern Hemisphere whose crown group representatives are restricted to Australia. 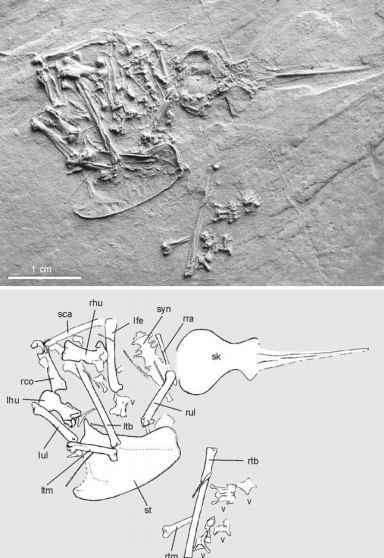 Earlier identifications of stem group representatives of the Megapodiidae in the Paleogene of Europe (Mourer-Chauvire 1982) were preliminary, and these fossils are now assigned to stem group Galliformes (Quercymegapodiidae). Many of the above-mentioned taxa probably had a wider distribution in the early Paleogene than the patchy fossil record currently documents. Because of the high degree of similarity of the early Eocene avifaunas of Europe and North America (see Sect. 17.1.1), stem group representatives of the Nyctibiidae and Trochilidae, for example, may also have occurred in the Paleogene of North America. These taxa could also have been present in the Paleogene of South America and other southern continents. Rather than there having been mere shifts in the area of distribution of the stem and crown group representatives of so many taxa, I assume that the distribution of their crown group representatives is relictual compared with that of the total group (pro Olson 1989; contra Cracraft 2001). The extant representatives of the above-mentioned taxa with a South American or Central American distribution have very different ecological niches; therefore, and because the modern descendants of these groups do not occur in the Old World tropics, the disappearance of their stem group representatives from the Northern Hemisphere is not easily explained by climatic changes alone (Sect. 17.1.2). It is more likely that biotic factors played a major role in the extinction of these groups. South America was isolated from other continents during most of the Cenozoic (Smith et al. 1994). Until the formation of the Panamanian Isthmus at the end of the Pliocene, this "splendid isolation" aggravated the intrusion of both potential competitors and invasive species which had an impact on prevailing habitat structures. Therefore, certain avian taxa may have persisted in such isolated areas as South America and Madagascar, whereas related taxa succumbed to more competitive species in all other parts of their area of distribution. Because the above-mentioned groups have very different ecological preferences, the ecological interactions which led to their extinction in the Northern Hemisphere must have been complex and multifactorial. Examples of such interactions were detailed by Cristoffer and Peres (2003), who hypothesized that, for example the higher density of large mammalian herbivores in Old World tropical rainforests is responsible for a lesser abundance of snails and butterflies, than in the New World tropics. Similarly, the much lower taxonomic diversity of placental mammals may have affected South American and Central American bird communities by the absence of key predators and potential competitors. Clearly, however, much more research has to be conducted to identify potential factors which ultimately affected the distribution of, for example, nectarivorous stem group Trochilidae as well as insectivorous and probably nocturnal stem group representatives of the Nyctibiidae in the same way.